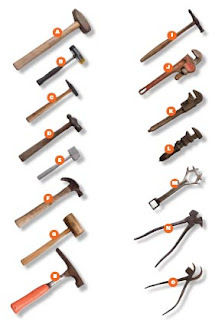 Click here for printable images of tools. Ball Peen Hammer - Flat on one working surface, rounded on the other, used by mechanics, iron workers, and steam fitters when assembling and repairing mechanical materials. Monkey "adjustable" Wrench 1900 - Older version of the adjustable wrench, needed in the day when nut and bolt sizes were not standard, in the carriage shops, automotive shops as well as by mechanical and plumbing craftsman. Claw Hammer - Most familiar carpenter and household tool used to drive nails of all sizes into framing materials and trim material, and with a slotted pry bar on the other side of the head, used to pull nails. Raw Hide Mallet - Another special purpose hammer consisting of tough hide (usually buffalo) tightly rolled inside a tube, usually used in crafts and trades such as jewelry and leather work. Buggy Wheel Multi-Wrench 1880 - Specialty wrench made with common nut and bolt sized openings used in assembly, repair and maintenance of buggy bodies and wheels. Rubber/Nylon Head Mallet - Most common hammer surfaces used when metal hammers can't be used, such as leather, sheet metal, jewelry, and other materials where crushing or marks need to be avoided. Cobbler's Hammer - A small delicate hammer with a round end face and a blunted punch shape end used by cobblers and leather artisans, especially in assembling and repairing shoes and boots. Meat Tenderizer - A type of mallet used to flatten and tenderize meat, pounding on a piece of meat laid out on a wood surface. Farriers Pliers - Specialty tool used by craftsman in care and shoeing of horses and mules, with tongs and pinchers built in for pulling, cleaning, straightening and repairing hooves and horseshoes. Tack Hammer - Small hammer used by upholsters to fasten material to chair and couch frames, delivering light precise blows to tacks and brads. Pipe Wrench - Specialty hand tool made with adjustable opening jaws, with curve to a surface, used by plumbers and steam fitters to tighten and loosen threaded pipe and connections, especially water pipes, steam lines and gas pipes. Sledge Hammer - Heavy hammer of steel used to drive large spikes, drive star drills, break rocks, and other purposes requiring a high force on the object. Masonry Hammer - Used by mason and brick layers to chip and divide brick and stone into desired sizes and shapes as an alternative to using a masonry saw, with one edge for tapping and striking flat blows, the other with a curved chisel end. Fencing Pliers - Specialty tool used to make fence, attaching barbed wire or woven wire by driving staples into posts, or using other end to pull staples, with built-in wire cutting machined surfaces. Ford Model T Wrench 1900 - General purpose wrench used by mechanics, for turning bolts and nuts and pipes.